Flash based solid state storage is fast. Referred to as a "zero-latency design", while the memory substrate responds to retrieval and write requests at very different levels of performance, there are not many performance differences across memory manufacturers. The key differentiators in solid state storage come down to two components that are added to that memory: the flash controllers and the I/O architecture that surrounds the device. While a few companies have spent a great deal of time developing sophisticated flash controllers, most have only put limited effort toward the system architecture that surrounds the flash memory modules. The problem with this approach is that both components have significant roles to play in the overall performance and scalability of a flash based storage device. 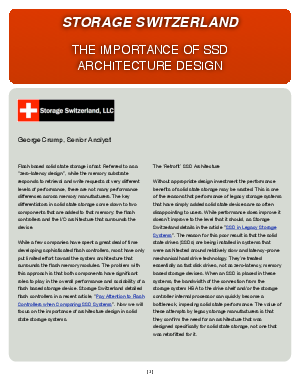 In this white paper, Storage Switzerland focuses on the importance of architecture design in solid state storage systems.